It took a lot of poker, played out over five starting legs in four different countries to whittle the 928-strong 2017 Suncity Cup field to the final eight, and it took a further three 60-minute levels to bring play down to the final two. The final two players in question were Korea’s Je Ho Lee and Hong Kong’s Sparrow Cheung, who cut an deal when play reached heads-up. 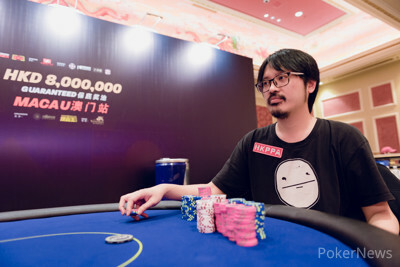 The pair decided on an Independent Chip Model chop that saw Lee guaranteed a payday of HK$1,605,472 and Cheung HK$1,445,528, with the two playing it out for the all-important title and trophy. The two also decided to speed up the action and reduce the level length down for 60-minutes to 20-minutes and the heads-up battle between the pair was an epic affair. The chip lead changed hands on four separate occasions and both players came within a whisker of busting before hitting the perfect card to survive. Eventually something had to give and the end came not long after Lee had pulled back in front. The final hand saw Lee limp the button and Cheung check from the big blind and all the chips went in on a queen-high double club flop. Cheung was the man to pull the trigger first with a jack-high flush draw, but found himself trailing to Lee’s king-high flush draw and blanks on the turn and river saw the Korean player win his first major title and take down his largest-ever career score taking home ~$205,528. While Cheung will be disappointed not to have been able to close out the win, the Hong Kong poker professional has ended the best year of his poker-playing career on a high. This was Cheung’s 34th final table appearance of 2017 and he already held the number one spot for most 2017 cashes worldwide with a massive 62 in the money finishes. This runner-up finish makes that 63 and brings his career tournament earnings up to over $1.2M. 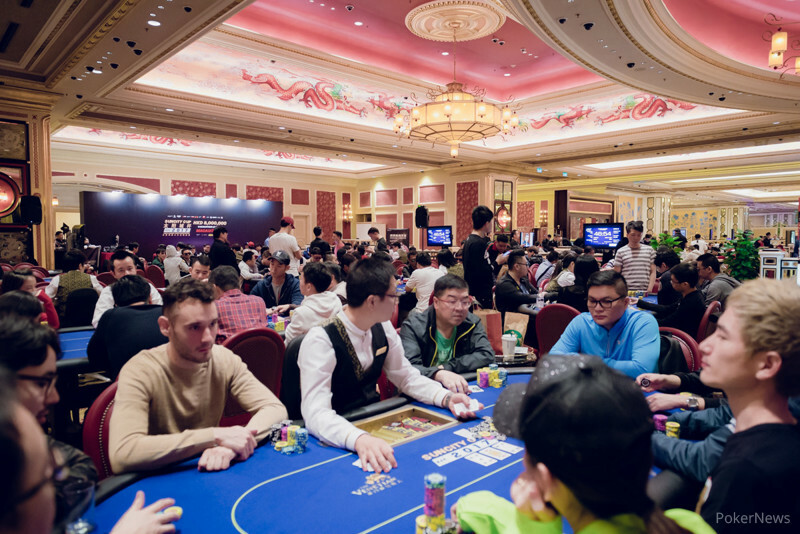 The day began with eight players, but this became six after a single level, with the final tables two Japanese players becoming the first two casualties. It was Suncity Cup Taipei frontrunner Sahashi Hideki who was the first to fall. Hideki came in as the shortest stack and could not find that all-elusive double-up, getting his last ten big blinds in with queen-jack suited over the top of a Danny Tang open. The Hong Kong player made the call with ace-ten suited, and despite Hideki flopping a flush draw, blanks on the turn and river saw him hit the rail in eighth place. This made Kosei Ichinose the short-stack and the poker pro departed toward the end of the first full level played after moving all-in pre-flop for his last seven big blinds with king-queen suited. It was Tang playing hitman once again, making the call from the blinds with pocket sixes, which held to bring the final table down to six. This opened the floodgate for a slew of speedy eliminations, with Chien Jenyen and Eugene Co departing in a single 60-minute level and Lim Chin Wei taking a big hit at the hands of Sparrow Cheung. It was Cheung’s turn to play executioner in the Jenyen bust-out, opening the action with a mid-position raise and then calling the Taiwanese player’s all-in shove. While Jenyen got the last of his chips in with pocket tens, these could not beat Cheung’s pocket queens and the field was down to five. Five quickly became four with Lee earning himself a double-up at Eugene Co’s expense in a blind versus blind battle, before finishing the job an orbit later. Co moved the last of his chips in from under-the-gun with ace-five and Lee woke up in the big blind with pocket kings to bring the field down to four. This did not conclude the carnage though, that honor again went to Sparrow Cheung though it was Lim Chin Wei who lit the fuse on a hand that would sizzle slowly before culminating in an explosion of action. The Malaysian player opened the action and picked up two callers before Cheung squeezed big from the blinds and all the chips went in with Wei’s pocket tens up against Cheung’s pocket queens in a hand eerily similar to Jenyen’s exit hand. Wei was left short and departed shortly after the break, getting the last of it in with queen-ten suited and running into Lee’s dominating ace-ten to bring the final table down to three. Danny Tang became the third place finisher around 40-minutes later, getting the last of his chips in from the blinds with pocket twos over the top of a Lee button raise. The Korean made the call with ace-six and paired his six to send Tang packing and take play heads-up. That concludes the PokerNews live reporting for the 2017 Suncity Cup Finale Macau. The event showcased some great poker and we hope you enjoyed reading about it as much as we enjoyed writing about it. 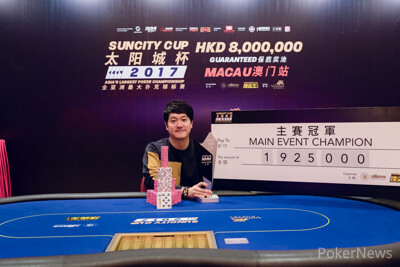 The epic heads-up battle has come to a close and the 2017 Suncity Cup Finale Macau now has a new champion in the form of Korea’s Je Ho Lee. The hand that settled things once and for all started off innocuously enough with Lee limping the button and Cheung checking his option in the blinds and the flop came down . This is when all the fireworks happened with Cheung moving all-in and Lee making a quick call. Cheung was the at-risk player with a dominated flush draw, though we have seen the Hong Kong player stage sicker comebacks than this. The watching rail crowded around calling for a jack or a three and Cheung waited with baited breath as his fate was decided. The saw Lee maintain his lead and the sealed the deal. That was an epic heads-up battle and one where both players gave it their all. Sadly for Cheung he finished on the wrong side of it today, but the Hong Kong player has had the best year of his professional career and can be proud of the effort he has put in today. Cheung shook Je Ho Lee’s hand and the Korean was clearly pleased as punch at taking down his first major title. That was some great poker and was a pleasure to watch. We hope you enjoyed reading about it as much as we enjoyed writing about it. Full end of day wrap to follow shortly. There have not been all that many flops played as of late and the rising blinds and antes have seen both players battle it out and settle things either pre-flop, or by simply moving all-in on the flop. Lee pushed Cheung off a big pot when the two got into a pre-flop raising battle, showing Cheung when the Hong Kong player folded and the Korean has edged back in front. Chips are changing hands so fast it’s tough to keep up with all the action. We missed the pre-flop action but arrived in time to see Cheung and Lee get all the chips in on a flop of we are not sure who shoved first, but Lee was the button. The margins between the two pre-flop hands are so narrow you couldn’t fit a piece of paper between them, but it was Lee who held the lead after the flop and he had Cheung covered so it was not looking good. However, while the turn was of no help to Cheung, the sure was and the Hong Kong player evens up the stacks once more. The first hand back after the break saw Je Ho Lee retake the chip lead. The Korean was the pre-flop aggressor making it 1.1 million to go from the button and Cheung called to bring in the flop, checking the action over to Leee, who bet another 1.1 million. Cheung called once more and the hit the turn, with Cheung check-calling a Lee bet of 1.7 million and the river completed the hand and the betting. Cheung turned over but was out-kicked by Lee’s and the Korean re-seized the lead. Both players are on a short 10-minute break. Sparrow Cheung has come to play and is not giving up without a fight and has just taken the chip lead for the first time since heads-up play began. It all started with a Cheung button limp and Lee checked his option from the blinds and it was off to a flop. Lee checked, Cheung bet 400,000 and the Korean player check-raised to 900,000, which Cheung quickly called and the paired the board. Lee now fired for 1.5 million and Cheung called once more, leaving himself roughly 3.3 million behind. As soon as the landed on the river Lee moved all-in and Cheung had a decision to make. The Hong Kong player chose to make the call for his tournament life and the cards were turned over. Lee showed down but was outkicked by Cheung’s and the Hong Kong player took a slender lead.